"Look, it's a 10^-19 chance, and you've got a 10^-11 chance of suddenly evaporating while shaving." It's brilliant on two levels; either it's a scientist with a great sense of humour or, and this is even better, there genuinely is a 10^-11 chance of evaporating whilst having a shave. Who knew? Anyway, a science techy geek like me can spend many hours on big physics, so a wander around the LHC website is a must at some point. Of course, from this I also wandered off to read Cory's article in the latest Nature: Big Data, welcome to the Petacentre. 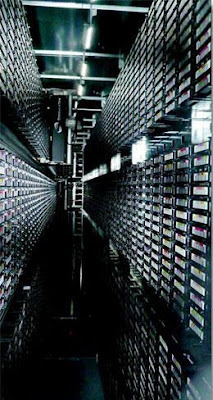 It's all about the not so fascinating idea of large data centres. Or so you might think , but 20 minutes of my time in between writing the last paragraph and this one says otherwise. Again, who knew reading about the incredible data load and the energy and colling requirements thereof could be so incredibly fascinating?